I don’t like waffles – there I said it! Although let me clarify that – I don’t like hot waffles topped with ice cream that melts and makes the aforementioned waffle soggy. Which is exactly why these ice cream sandwiches hit my sweet spot – and this honeyscotch sauce? People, you’re going to want to put it on absolutely everything. Including just a spoon. Or toast. I’m open to suggestions. But I hear you still shouting at me in caps lock – BUT WHY DON’T YOU LIKE WAFFLES?! Well, this is the story of how I unwittingly became the waffle queen of Paarl and also why I can’t stand hot waffles. I was fresh out of chef school with a yearning to do desserts as fancy and complicated as possible – excited to be working in the pastry kitchen of the Grande Roche hotel in Paarl which was, at that time, the best restaurant in Africa. I remember thinking how I was going to create chocolate masterpieces with ridiculously difficult curls and piping and creams and espumas – plated desserts which looked like they’d come straight from a Michelin-star restaurant. But, on my first day there, I was told to make waffles – in a blender. I was mortified and disappointed. I was also young and naïve because in a big fine-dining restaurant with a kitchen of 40 chefs, as a below-junior chef (what is called a commis) I should’ve known that I would get every job that nobody else wanted to do. Peeling potatoes, cleaning fish, cutting vegetables into ridiculously tiny little cubes (which would later just be put in a blender), washing herbs, chopping chocolate and of course, making the waffles which the rich kids ordered when they didn’t want anything ‘fancy’ for dessert. I remember thinking to myself that I might as well have gone to work in a Milky Lane. I can still taste the disappointment in a hot waffle today. 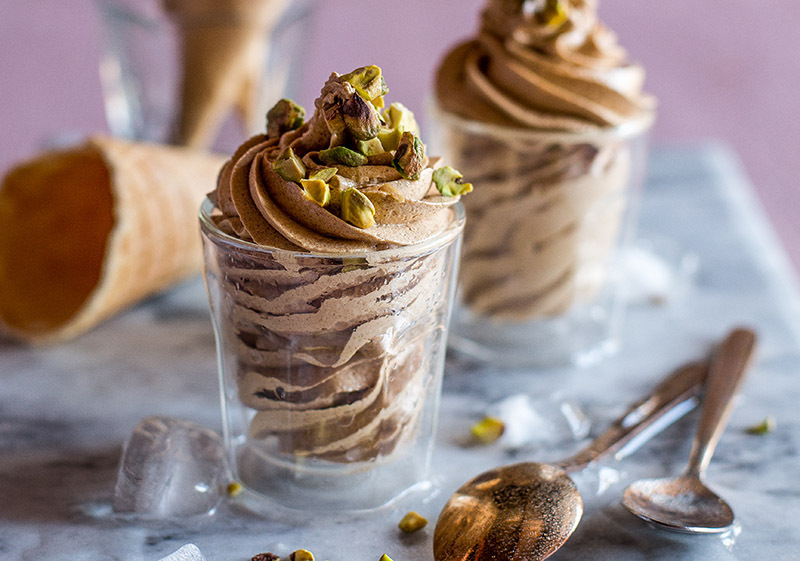 But what is definitely not disappointing is the recipe I left with – shove everything in a blender and keep it in the fridge for a couple of days? Winning! You know what’s also winning though? The combination of these sandwiches with a glass of Haute Cabrière Chardonnay Pinot Noir! 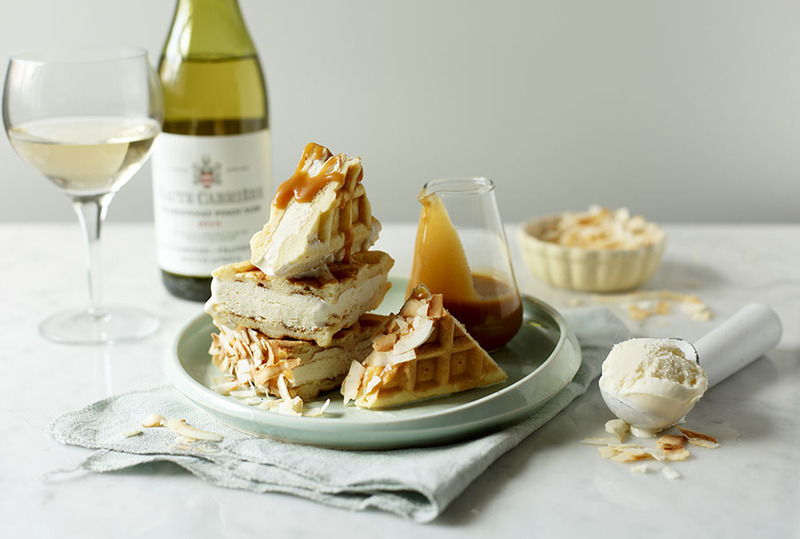 Whoever said that wines were difficult to pair with desserts obviously never tasted the combination of honeyscotch, vanilla and lemon zest with this chardonnay – it’s just mind-blowingly delicious! If you’d like to make a meal of it, head over to Sarah Graham’s beautiful blog and try out the delicious Cauilflower and Chorizo Breakfast Hash she’s created. And in case you’re wondering, I’ll eave you with this wisdom: waffles = breakfast food. 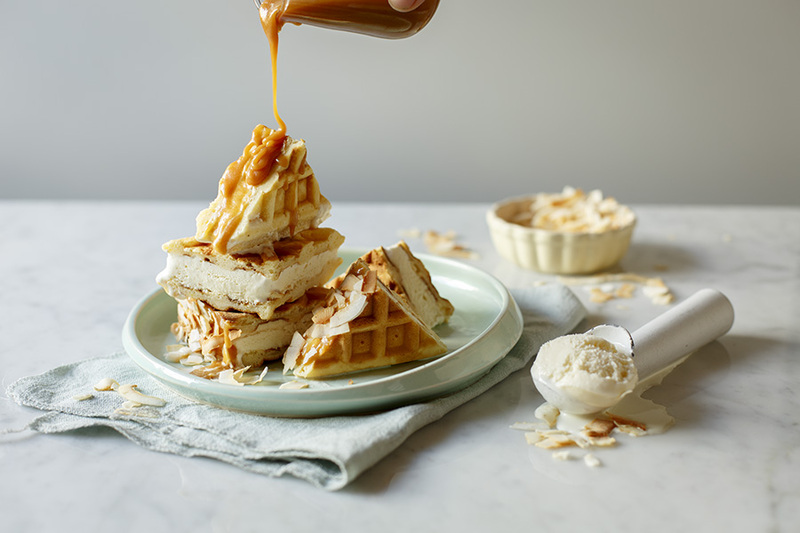 Therefore you can eat waffle ice cream sandwiches for breakfast! Like I said, winning! To make the waffles, place all the ingredients in a bowl and blend together with a hand blender until smooth. Preheat a waffle iron – it should be very hot! Then brush with a little butter. Pour 1/3 cup batter onto each waffle mould then close and cook until golden brown. Repeat with remaining batter – you should have about 12 waffles. Allow to cool thoroughly. 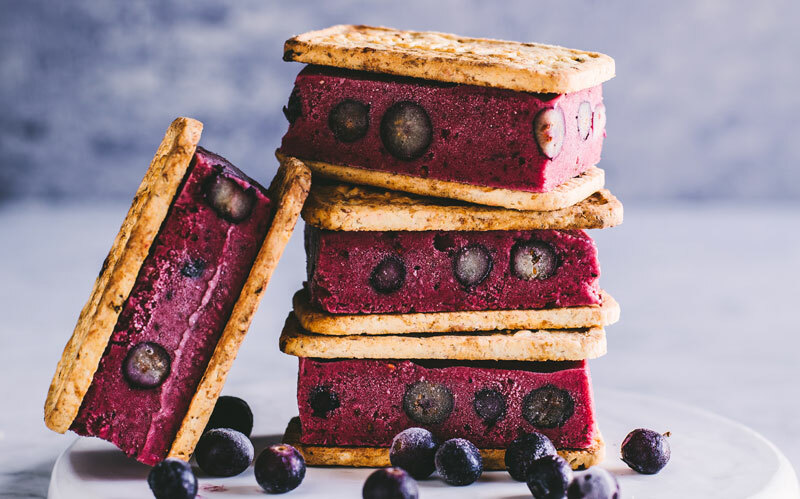 To assemble the ice cream sandwiches, place half the waffles in a baking tray then top with the softened ice cream and sandwich together with the rest of the waffles. Wrap with foil and freeze until firm. 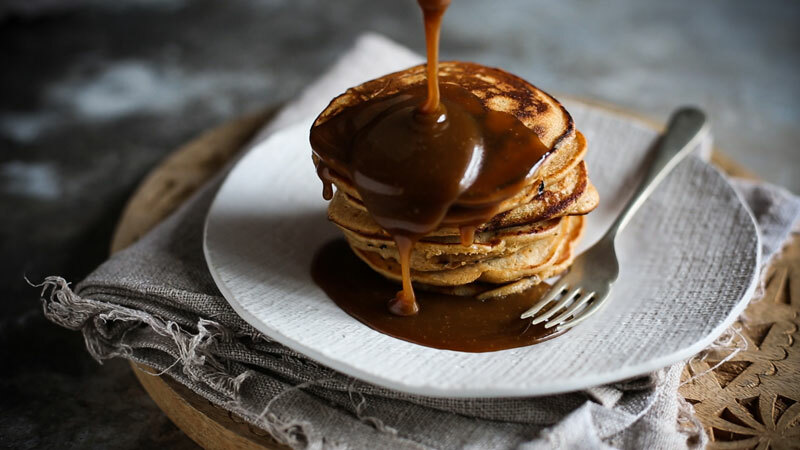 To make the honeyscotch sauce, combine the sugar, honey, salt butter and 1/3 cup of the milk in a saucepan and bring to the boil. Simmer until soft ball stage. Stir in the remaining milk and cook for 3 minutes until smooth. 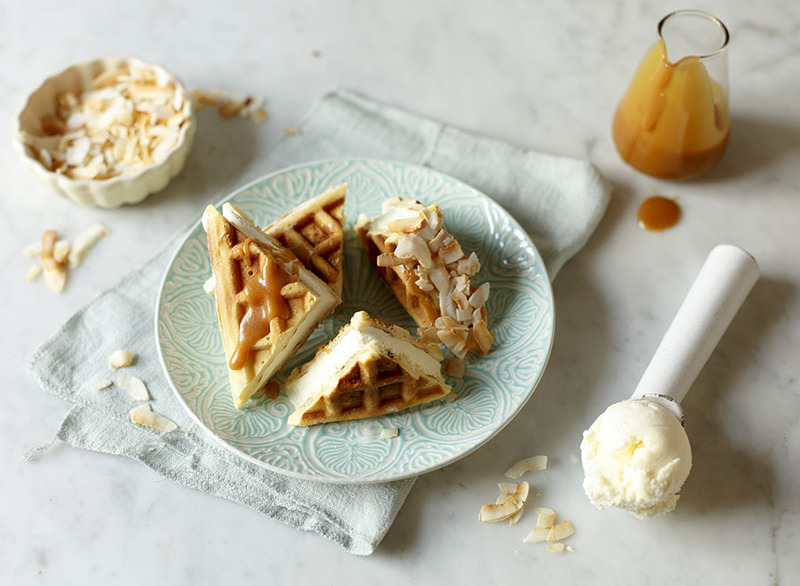 To serve, the cut waffle sandwiches into triangles then dip one side into the sauce and then into the toasted coconut. 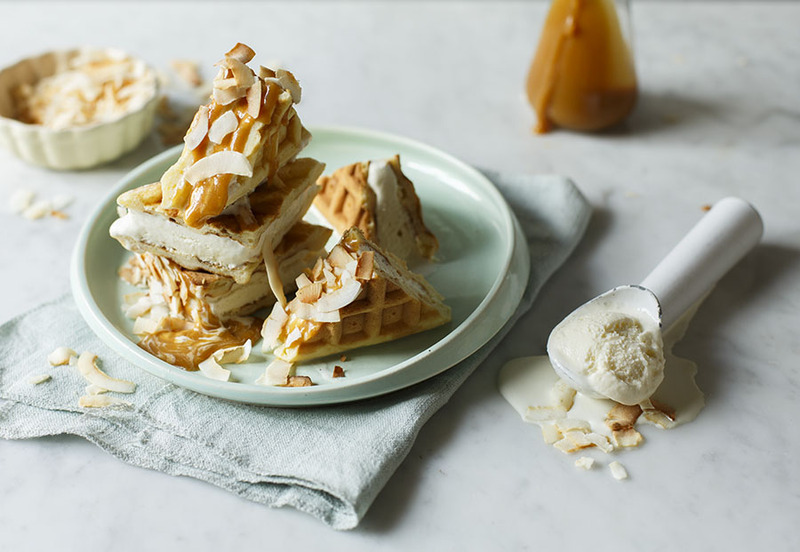 Serve drizzled with extra honeyscotch sauce and a sprinkling of toasted coconut flakes. TIP The waffle mixture can be kept covered in the refrigerator and used for up to 5 days. Disclaimer: This post has been created in collaboration with Haute Cabrière – I only work with brands I think are awesome and that I actually use myself. hi Katelyn, i don’t have a waffle maker, would this work with store bought waffles?